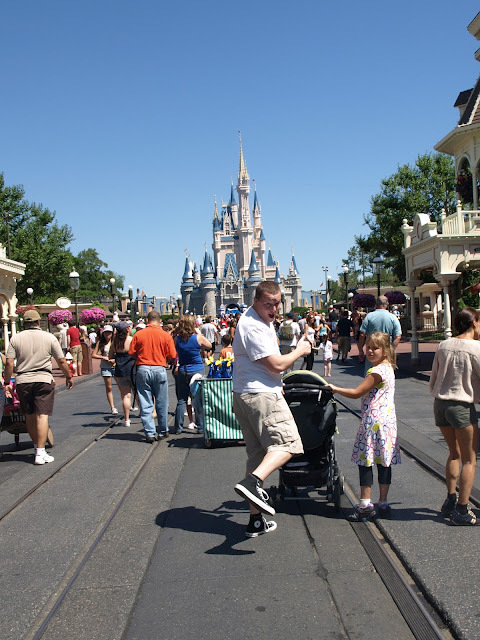 During my lifetime I have been to the Magic Kingdom (and other Disney parks) more times than I can count. Well... maybe not more times than I can count, but definitely more times than I can easily recall. We used to go almost every year when I was little. We would visit one of my aunts (actually... one of my great-grandfather's sister-in-laws... is that right? I think that's right. Mom? Jim? Other family members who are reading? Aunt Flo was Poppy's SIL? I'm losing my mind.) during our February "Winter Recess" every year. 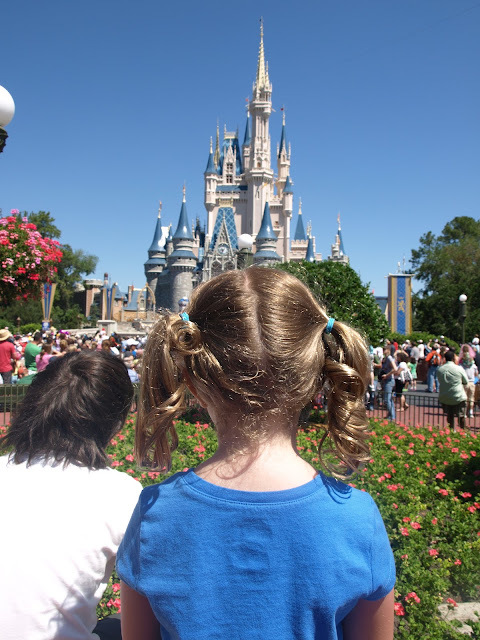 While we were there in Sarasota we would take a day trip to Disney. Then, on top of my multiple childhood visits (oh... and the high school band trip to Disney) add to that the number of times we've visited since my brother and my parents moved to Orlando. We take a trip to a park just about every visit. I admit it's a bit of an obsession. So... what I'm saying is I honestly couldn't tell you how many times I've been to visit Mickey. I can tell you that I've learned a few things from my many visits. No matter how many times you go... when Cinderella's castle finally comes into view... you get almost fidgety with anticipation. Cinderella's Castle. You must take photos of it. Each and every time you see it. You know how they call it the Magic Kingdom? And they talk about making "magical memories"? And when you enter you might find yourself saying things like "let the magic begin!" And you might hear people saying "Have a magical day!" Well... the place is totally magic. I mean... look at Ana and Zoe! Not only were they pleasant to each other... there was actually hugging and loving. There may have been multiple occurrences of hearing "you're my favorite sister, ever". And neither one of them screamed all day long. MAGIC. Not only that... Ana and Grace were actually caught holding hands!!! And looking at each other lovingly!!! It's unheard of. All of a sudden PopPop and Jim and Nick were all like "Get the camera!!! Hurry!!! Take this picture!!!" MAGIC. The first time you ride "It's a Small World" you will be amazed. You will be wide eyed with wonder. You will not know what to look at. And... if you are the mom of someone riding "It's a Small World" for the first time... you will experience a special kind of joy while you watch them instead of the ride. You won't watch the little children dancing and singing all around you. You will stare and smile at your child instead. Ana spent the ENTIRE ride repeatedly pointing and saying "It's amAAAzing!!! It's amAAAzing!!! Look Mama... it's amAAAzing!!!" Little known fact... even grown men like Prince Charming's Carousel. Strawberry Shortcake tastes better at Disney. It tastes EVEN BETTER when it's being snitched from your Mom. The best way to get your children to sit still for 2 seconds at Disney? Keep them at the park for 12 hours and then point them in the direction of exploding fairies. Um... I mean fireworks. So many important things must be learned in order to truly enjoy the magic. Are there any other Disney park obsessed people out there? Any other little known important facts that should be shared?